Heeding the call of the open road this summer? 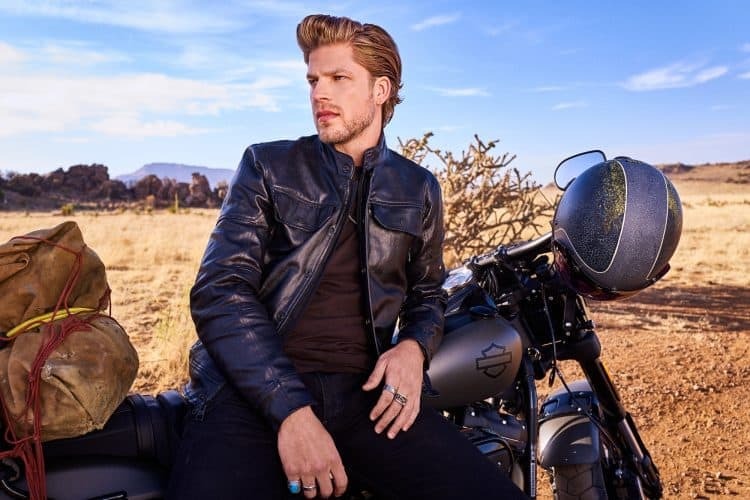 Two iconic American brands, American Crew and Harley-Davidson are combining forces for a celebration of heritage and values called "Style for the Road." Beautifully photographed in the desert of Marfa, Texas by editorial photographer Raccuglia, it captures the allure of a nomadic summer spent savoring life. I asked how American Crew's hair stylist Mike Sharkey how he achieved the perfectly imperfect, laid-back, biker hair. Cleanse Hair (and body) with American Crew 3-in-1 Shampoo, Conditioner and Body Wash. Apply a liberal dosage of AmericanCrew Firm Hold Gel from root to ends, and with hands/fingers and the heat of a blow dryer lift the front up away from the scalp, focusing heat in this area for height and structure memory. Continuing to use hands/fingers, direct the sides back and slightly down behind the ear. Once the hair is dry and the desired shape is achieved, apply American Crew Boost Spray at the scalp area for added anti-gravity and support. Finish the style by applying a liberal dosage of American Crew Cream Pomade just above the scalp to ends. With a paddle brush, comb the hair into place and refine where needed. Cleanse hair with American Crew Daily Shampoo. Add a liberal dosage of American Crew Fiber Cream scalp to ends, and with a wide tooth comb sculpt in the shape focusing on the height in the front. For the beard, apply one pump of Cleanser starting at the most dense area of the beard, allow to air dry. Work small dosage of the American Crew Beard Serum into the beard. What to Do About Dark Circles Under Your Eyes?